This Sunday at fabled Daytona International Speedway, NASCAR will kick off another season of Sprint Cup racing with the running of the 56th Daytona 500. This is still the only sport that starts its season with its biggest event, and there is a reason it has become known as the Great American Race over the years. Coverage of this year's Daytona 500 on FOX begins at 1 p.m. (ET). The following is a brief look at my top favorite, contender and longshot to win this season's Daytona 500 based on betting odds provided by Bovada. Last season I went with Dale Earnhardt Jr. as my top favorite, and he paid off on his closing 10/1 odds with a win. 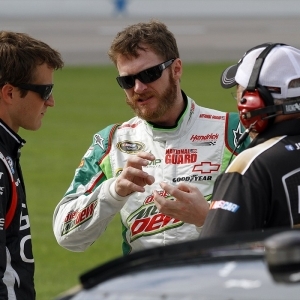 It was the start of one of his best seasons in the Sprint Cup series in which the No. 88 car claimed four checkered flags to go along with another eight Top-5 finishes. I am looking for Dale Jr. to carry that momentum right into this season with another strong run at Daytona as a 9/1 favorite to win again. His average finishing position at this track is just 13.4, but in his last 10 runs in a Sprint Cup point race here, Junior has placed fourth or better five times. Jeff Gordon and NASCAR racing have become synonymous over the past few decades as one of top drivers the sport has ever seen. This will be his last full-time season racing in the Sprint Cup series, so right of the bat you know that the No. 24 race team will be all amped up to start things on a high note. Gordon has already proven he is in championship form by qualifying for the pole position in Sunday's race, and he has to believe there is still some unfinished business after finishing fourth in last season's Daytona 500. He has been opened as a 10/1 second-favorite to claim to his seventh career victory at this track in a Sprint Cup point race. The Daytona 500 is one of the most wide-open events of the year as one of just a few restrictor plate races on the 36-race Sprint Cup schedule. This, in turn, keeps any driver that can stay on the lead lap down the stretch in the running to claim the checkered flag. Looking at Bovada's list of longshots with odds of 20/1 or higher, I have zeroed in on Kasey Kahne as the best value on the board at 25/1. Daytona has not been one of his favorite tracks since breaking into the Sprint Cup series as the 'rookie of the year' in 2004 with an average finishing position of 19.9. However, three wrecks in his last six races here has not helped the cause. Kahne still remains one of the more successful drivers in this series over the past 10 years with 17 Sprint Cup point-race victories. Jimmie Johnson will set his sights on his third career Daytona 500 title this Sunday as a 12/1 third-favorite on Bovada's current board. He last won this race in 2013 when he swept the season series at Daytona with a win in the second race at this track later that year. There are actually a total of five drivers with 12/1 odds to win on Sunday. Johnson is joined in this group by the defending 2014 Sprint Cup Champion Kevin Harvick. Also included at 12/1 odds are Joey Logano, Kyle Busch and Matt Kenseth. A few other notable drivers in the next wave at 14/1 betting odds to win are 2012 Sprint Cup Champion Brad Keselowski, Carl Edwards and Denny Hamlin. Tony Stewart has never won a Daytona 500 in his storied racing career, and his odds to finally win the Great American Race this time around are set at 16/1.